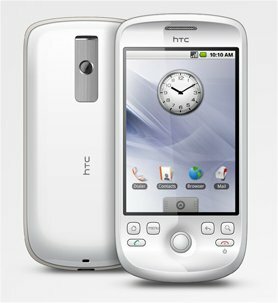 I became the owner of a HTC Magic at the beginning of the summer. Although an ‘I.T. Professional’ I have never owned a smart phone before. Bearing this in mind I can’t make any comparisons with other smart phones. However this device has become one of my favorite pieces of techno-kit, surpassing my beloved Zen Xtra, which has served me well for many years and equaling my Squeezebox Boom, which I may write about some other time. The HTC Magic appealed to me for a couple of reasons. It wasn’t an iGadget which tied me into irritating iSoftware and I was already a user of GMail, associated calendar and other apps. I should say at this point that this is the ‘with google’ version of the phone I am using. The HTC Magic comes with the obligatory charger and mediocre in-ear phones, plus an uninspiring white pouch to keep it safe from scratches. I bought InvisibleSHIELD to further protect the finish although I would not recommend it as it is in 9 extremely fiddly to fit pieces and could not, by any stretch of the imagination, be called invisible. In retrospect I would go for a good quality screen protector instead. Switching on the HTC Magic for the first time you are asked for your Google account credentials and within minutes, Internet connection permitting, your mail, calendar and contacts are all synchronised with your on-line account. I also installed Google Calendar Sync at work which means that my Outlook calendar syncs with my on-line Google calendar and thus with my phone, perfect :). The touchscreen is clear and responsive, even with a protector glued to it, and I have never felt the need for a stylus as the keyboard can be used precisely even with your thumbs. The HTC Magic interface is clean looking and easy to use. It has three ‘desktops’ which can be accessed by swiping the screen left or right. Shortcuts and widgets can be placed here, wallpaper and themes changed etc. and by turning the phone you can either work in portrait or landscape. An application tab resides at the bottom of the screen and opening this reveals all your installed software. One criticism here is that although you can have folders containing icons on your desktop there is no way to further organise your apps within this tab. Making a call is easy and the dial pad is always within reach should you be put through to an automated system. Another easily accessible tab allows you to hold, switch from or to a bluetooth device or turn on the speaker phone. Sending texts and emails is also a doddle with suggested words appearing at the bottom of the input screen for you to select should you wish. The keyboard is qwerty, simple to use and quick to access numbers and special characters. All in all I think this is a great phone, it comes with a number of good quality applications and by using Google’s Market Place you can search for, by name or via category, for thousands more. Most of the applications are free but even those are not are of minimal cost and if you uninstall within 24 hours you get a complete refund. There is also an option to allow the installation of non verified software should you be happy to do so. The device also comes equipped with a compass, GPS, WiFi and decent camera all of which are made good use of by the huge variety of available software. Finally, should you wish, you can develop your own apps using the free SDK and Eclipse Software suite.